Otoplasty, ear pinning, reduces the appearance of prominent ears by bringing them closer to the head. Prominent Ears can be a source of embarrassment for many patients; however, we are happy to offer a solution: Otoplasty. It is a common cosmetic plastic surgery procedure that literally means ear changing. By bringing the ears closer to the head, Ear Pinning lets patients enjoy shorter haircuts and/or ponytails, and can be a huge confidence builder for those that worry about their ears sticking out. The primary scar for Otoplasty Surgery is in the fold behind the ear. This hidden access allows the ear to be reshaped discreetly. Even the early scars, as shown below, are only visible from behind and only if you have short hair or wear your hair up. 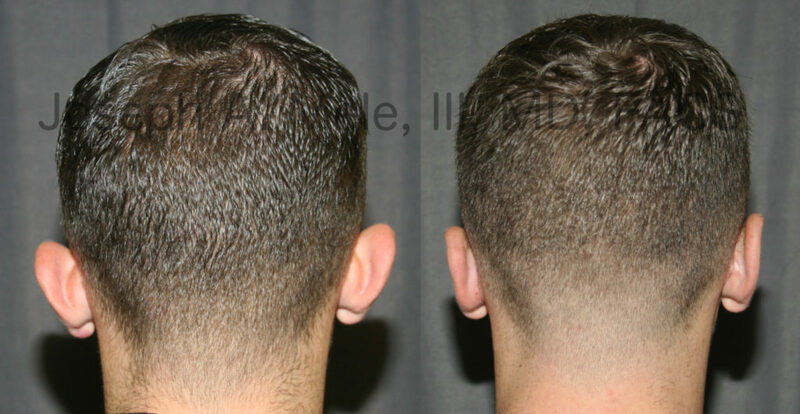 Many of my patients with prominent ears keep their hair long to cover them. 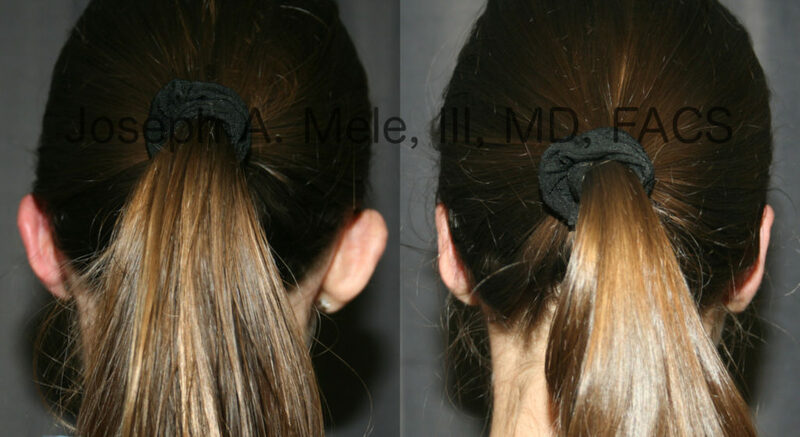 Long hair can also make recovery easier after Otoplasty, as any postoperative swelling is well hidden. After Cosmetic Ear Surgery, you’ll have the option of cutting your hair or wearing it up, without the ears protruding. If you live in the East Bay Area, or California’s Central Valley, summers are hot. The option to confidently wear your hair off your ears is a blessing. Otoplasty scars are hidden in the folds of the ear. The primary scar is behind the ear. The Otoplasty Before and After Photos above show early scars. Even the early scars are well hidden, and as they mature, they become even more discreet. In the above Ear Pinning Before and After Pictures, the ear prominence is reduced in three ways. The top of the ear is folded in, the cup of the ear is reduced and the entire ear is rotated back. The actual height of the ear has not changed, though the ears appear smaller. More details about Ear Pinning can be found on my website’s Otoplasty Page. How Young Is Too Young For Otoplasty? Otoplasty is used to reduce the appearance of prominent ears and to improve symmetry. The earliest the procedure is performed is at five years of age. I am often asked by parents, “How young is too young for Otoplasty?” Prominent Ears are usually evident at birth, and are often fixed before adulthood. The ears reach 85% of their adult size by age five, and five years of age is the earliest that Otoplasty is normally performed. There is evidence that some ear deformities can be corrected by early molding. Headgear is worn, beginning in the first few days of life, and it needs to be worn constantly for months. As you can imagine, this can be difficult to maintain in a baby. The reason early molding works is that the mother’s estrogen crosses the placenta and circulates in the infant. Estrogen makes cartilage more flexible. In the mother, this facilitates opening the pelvis for delivery. This also softens the cartilage in the infant’s ears. By molding the ear cartilage early, the hope is that as the estrogen levels drop, the ear’s cartilage freezes in this new and improved position. This is likely the reason why splinting later in childhood has not been successful in changing the shape of the ears. Ear pinning can be a very rewarding procedure. If you are considering Otoplasty for yourself or your child, be certain to seek the advice of an experienced, Board Certified Plastic Surgeon. Every ear is different, and several techniques have evolved to treat these differences. If you are in the San Francisco Bay Area, call (925) 943-6353, to schedule a private consultation appointment in my Walnut Creek Plastic Surgery office.